With the release of the 2015 Ford F-150 finally upon us, it felt appropriate to recognize its (great?) granddad on today's Rust In Peace. 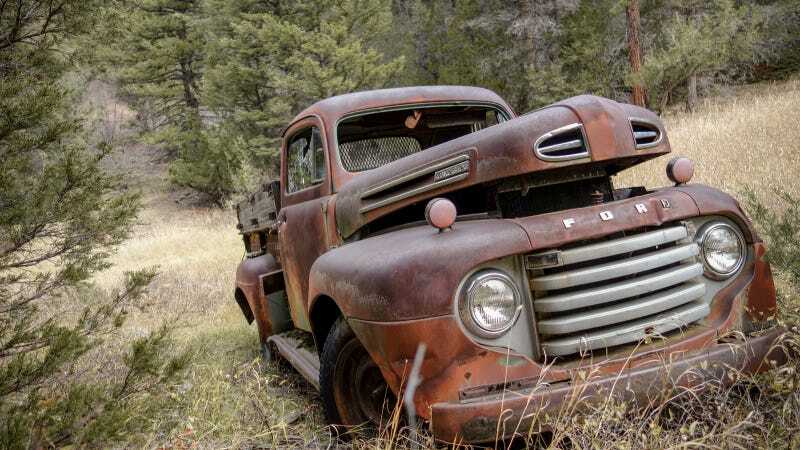 This would have been one of the very first F-Series trucks, built sometime between 1948 and 1950. Back then you could have an F-1, F-2, or F-3. None of that "...'50" nonsense. Improvements over Ford's pickup before this one included a larger cab and one-piece windshield. There were two engine options: a 95 HP 226-cubic-inch inline six, and 239 V8 that made an additional 5 HP. This one was photographed in 2013, and actually looks like it might be restorable if not highly harvestable.